It's Over - We hope you enjoyed the show! We hope you enjoyed the Show, which featured free admission on Saturday, March 7. The ANA National Money ShowSM was held March 5-7 (Thursday-Saturday), 2015 at the Oregon Convention Center, 777 NE Martin Luther King Blvd, Portland, Oregon. The local co-host clubs were the Pacific Northwest Numismatic Association, the Willamette Coin Club and the Salem Numismatic Society. 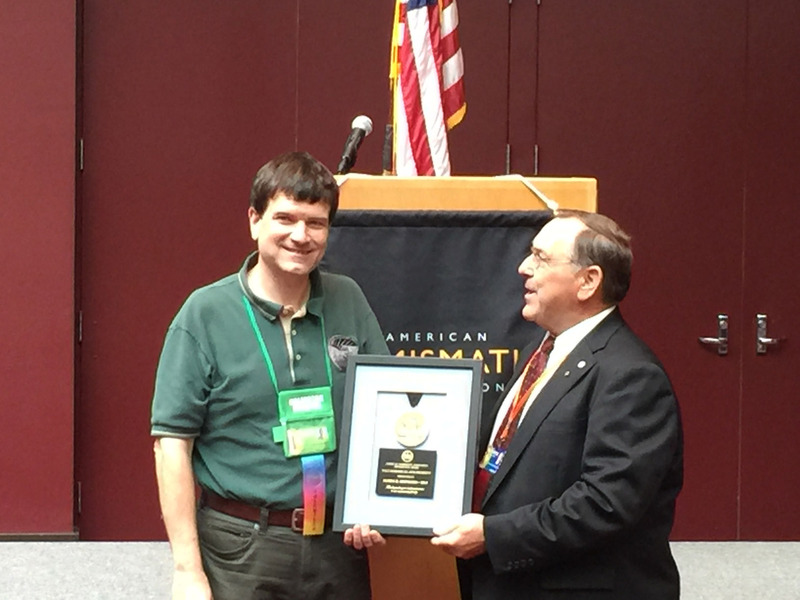 Special pre-convention events included "Fundamentals of Grading US Coins" and "Numismatic Valuations." Raymond Kaskey, esteemed artist and sculptor of Portlandia, was available at 11 a.m. each day of the show as a guest of the PNNA for informal "meet and greet" and free autographs. This activity took place at the host club table, where medals were for sale. See 2Q 2014 The Nor'wester for more background information about Portlandia. Online medal sales are open again for copper medals only. Medals, including special numbered sets, were available at the show. See the PNNA memorabilia catalog page for these medals and this show. | See the medal sales page. Pre-convention: As General Chairman for the convention and on behalf of the host clubs (Willamette Coin Club, PNNA, Salem Numismatic Society), I would like to invite each and every one of you to attend this event and everything it has to offer. Also consider picking up one of the convention medals or sets. 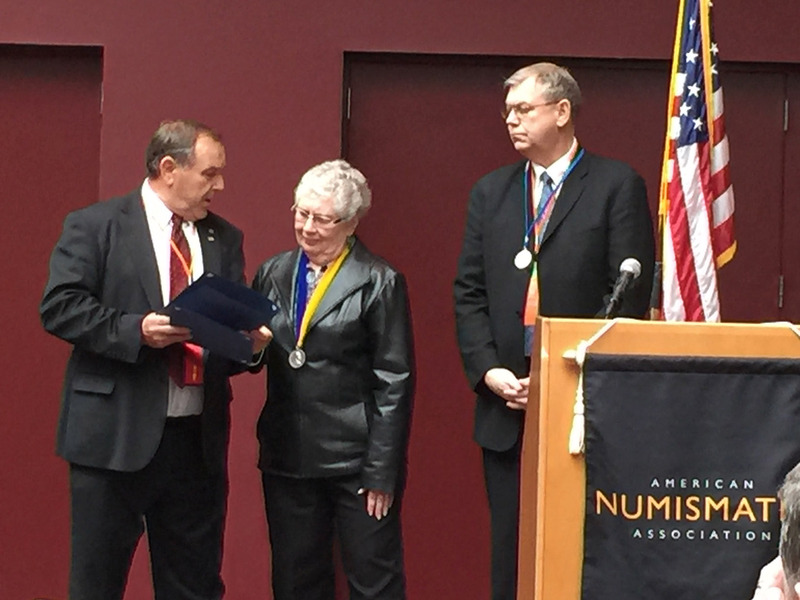 Post-convention: See PNNA President's message for the 2nd Quarter of 2015. See the ANA post-convention thank you resolution (PDF file). 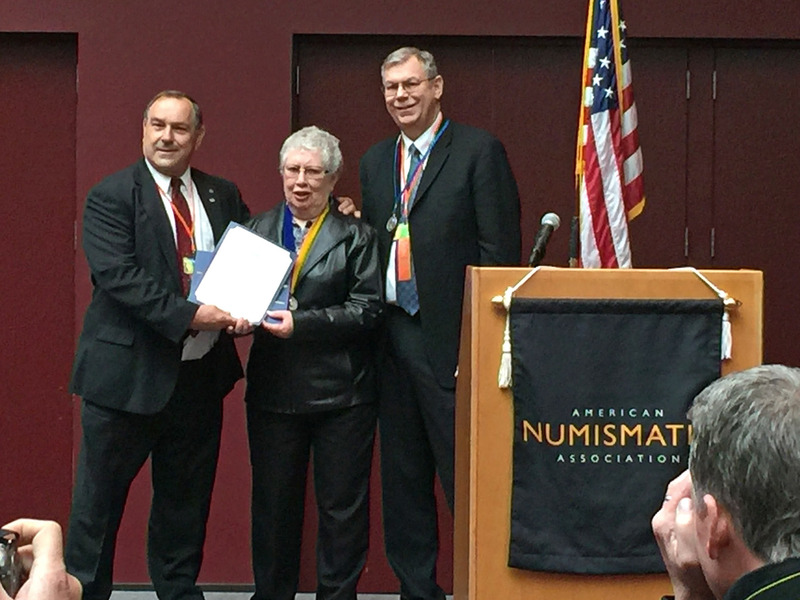 The American Numismatic Association's 2015 National Money ShowSM welcomed a total of 4,592 people for the three-day event, held March 5-7 at the Oregon Convention Center in Portland, Oregon. Attendance was strongest on Saturday, March 7, when 1,420 members of the public turned out for free admission and free, educational appraisals on up to three coins or other numismatic items. 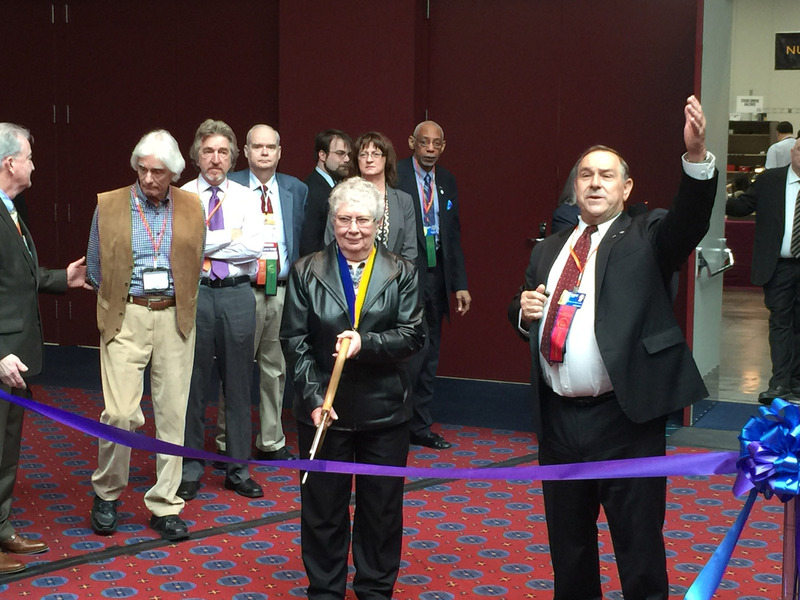 "Overall attendance during the Portland National Money Show was a little slow to start, but we had a great turnout by the end," said ANA President Walter Ostromecki. "Our Saturday attendance was particularly strong, with the public taking advantage of free admission and free appraisals on numismatic items. We also received some great media coverage from the local television affiliates, and the event was featured on National Public Radio's 'Here and Now' program, which airs all across the nation." Stack's Bowers Galleries proudly presented the Official Auction for the Portland National Money Show, including selections from the Highland Collection. This compact sale brought big results, grossing a total of $3,134,799. Opening ceremony (March 5) photos courtesy of James Reinders. and sculptor Raymond Kaskey (right). Middle row: Guest of honor Kathy Rowe, wife of the late Larry Rowe, former ANA convention general chairman for Portland and Seattle. Bottom row: ANA Presidential Award recipient James Reinders (left/center); award recipient James Free (right). Left: A view of the bourse before public opening on Saturday morning, taken from the collector exhibits area. 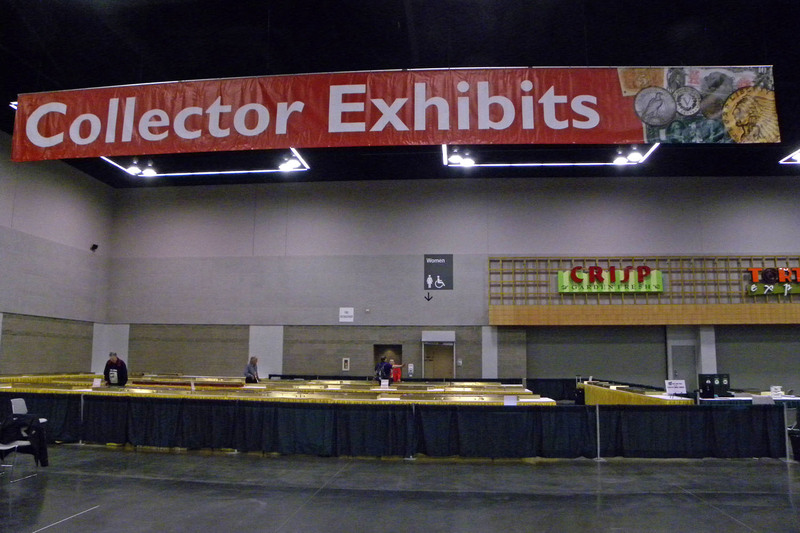 Right: The collector exhibits area itself at the same time. It became much busier later in the day! Photos and report courtesy of national volunteers John and Nancy Wilson. Left: Ribbon-cutting ceremony with guest of honor Kathy Rowe. Right: Host committee members ("red shirts") pose with ANA President Walter Ostromecki, Jr. ("suit"). 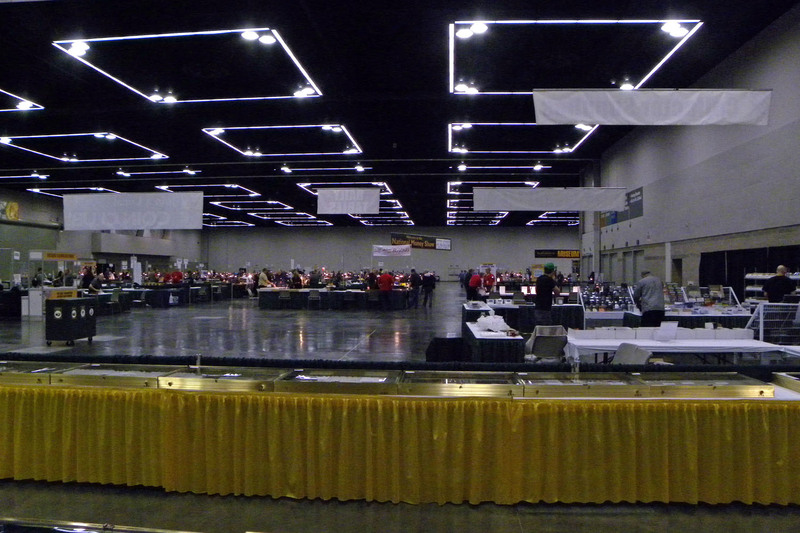 Thank you Portland, ANA Staff and Board, Hosting Coin Clubs, General Chairman and his Committee, Volunteers and Participants - The American Numismatic Association (ANA) National Money ShowSM (NMS) held at the Oregon Convention Center on March 5-7, 2015 was a very successful coin convention. This was the sixth ANA convention held in Portland. Attendance at the show was steady for the three-day event. Our personal thanks to ANA Convention Director Rhonda Scurek, Executive Director Kim Kiick and all the staff for their tireless work. Thanks also to President Walter Ostromecki, Jr. and the board for their work on this convention. 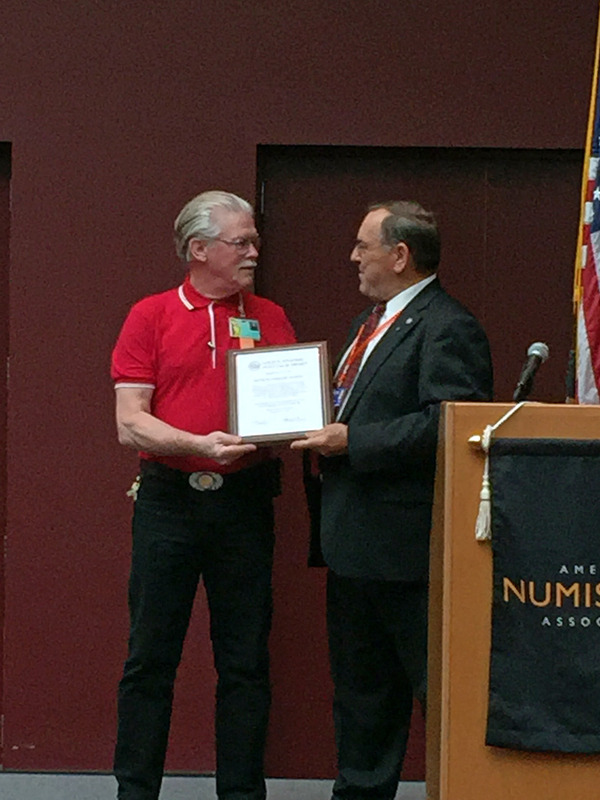 A HUGE thanks to General Chair Danny Bisgaard, his committee and volunteers, the host clubs (Pacific Northwest Numismatic Association, Willamette Coin Club and Salem Numismatic Society) and the National Volunteers for their outstanding and dedicated work on this convention. Everyone connected to setting up, during show hours and breakdown, did a superb job. We were pleased to see the ANA volunteers and local committee work well past the time the show ended and right alongside the ANA staff. A special thanks to the exhibitors, judges, speakers, PPI Security, the numismatic press participants, Coin Television, the U.S. Mint, show sponsors and patrons, scout and kids zone activities, show program, coin club tables and meetings, and medal and commemorative stamp designers. Thanks to StacksBowers (stacksbowers.com) for holding a successful official ANA auction at the convention and supporting the ANA. The ANA owes a debt of gratitude to the over 400 dealers who had tables or purchased early bird badges. The museum showcase had many outstanding coin and currency items displayed such as the rare 1933 $10 Eagle, The Brasher Doubloon, rare Alexander the Great coins and a great selection of Bebee collection notes, featuring a $50 1891 Treasury note with Serial #B1 (plate note in the Friedberg Paper Money of the U.S. reference). Once again the ANA had an appraisal area of experts that visitors could go to and get an evaluation on their numismatic items. 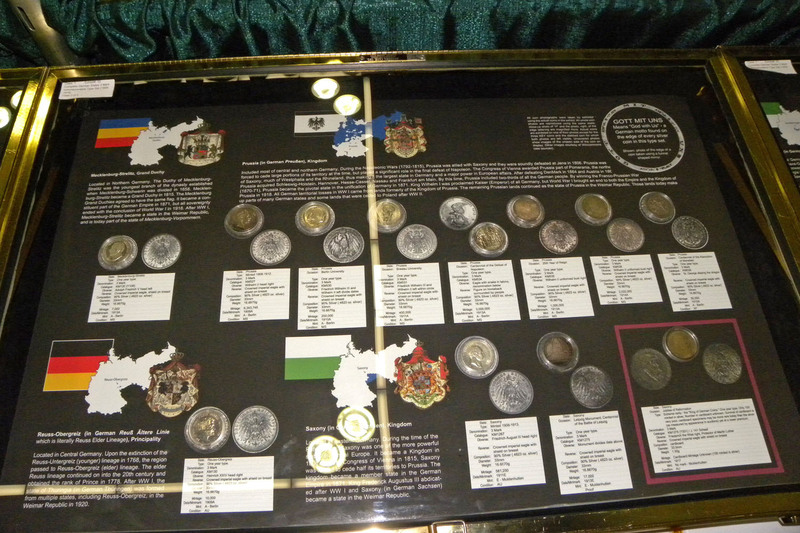 The area was kept busy with visitors who wanted an evaluation on their numismatic items. Thanks again to everyone who assisted and helped at this convention. Make sure you visit www.money.org and Facebook to see the videos and many pictures taken at the convention by Kurt Bellman, the Wilsons and ANA staff. We look forward to the ANA World's Fair of MoneySM to be held in Rosemont, Ill., August 11-15, 2015. Photo: Participants in the ANA-sponsored district representatives lunch included PNNA editor and ANA MintMark (club rep program newsletter) editor Eric Holcomb (front left in plaid shirt with convention chairman and Oregon rep Danny Bisgaard behind), Richard Jozefiak of Alabama (front right) and ANA Club Communications Coordinator Tiffanie Bueschel (back right). Does your ANA-member club have some news to share with other clubs? If so, send your news to Eric (eric@holcomb.com) for possible use in the next MintMark. Photo courtesy of Richard Jozefiak. Information about exhibiting at this event can be found on the ANA National Money ShowSM website and the PNNA exhibit page. Please note that exhibit applications were due January 30, 2015 (following a one-week extension). There were 37 exhibits at the show, with an excellent variety! Do you aspire to be an ANA Exhibits Judge? The National Money ShowSM in Portland offered an opportunity to achieve that goal. ANA Chief Judge Joseph Boling conducted a Judge's Familiarization and Certification Class beginning at 11:30 a.m. on Thursday, March 5. Participants demonstrated their judging skills on the exhibits in Portland. The next opportunity will at the Worlds Fair of MoneySM in Chicago in August 2015. 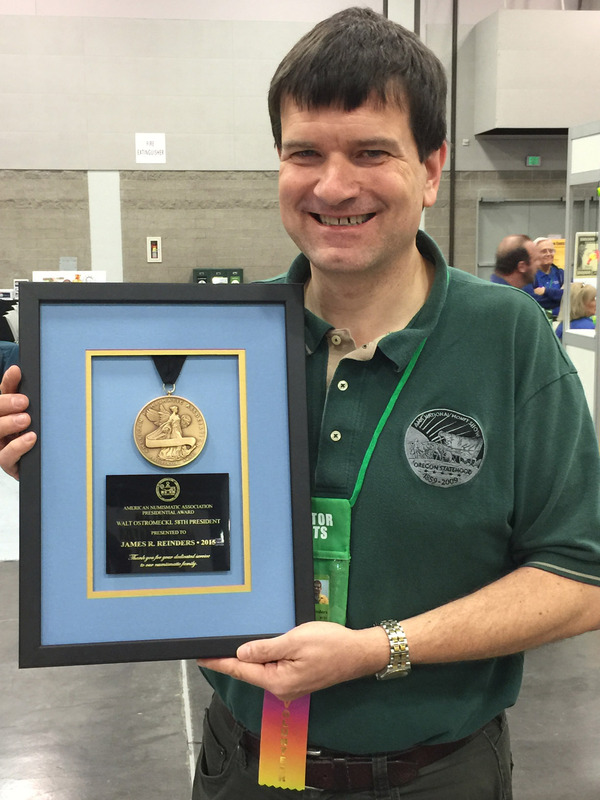 Congratulations to champion numismatic exhibitor James Reinders! He entered an exhibit in all six classes, and won both first and second best-of-show. Photo (upper left): Steven J. 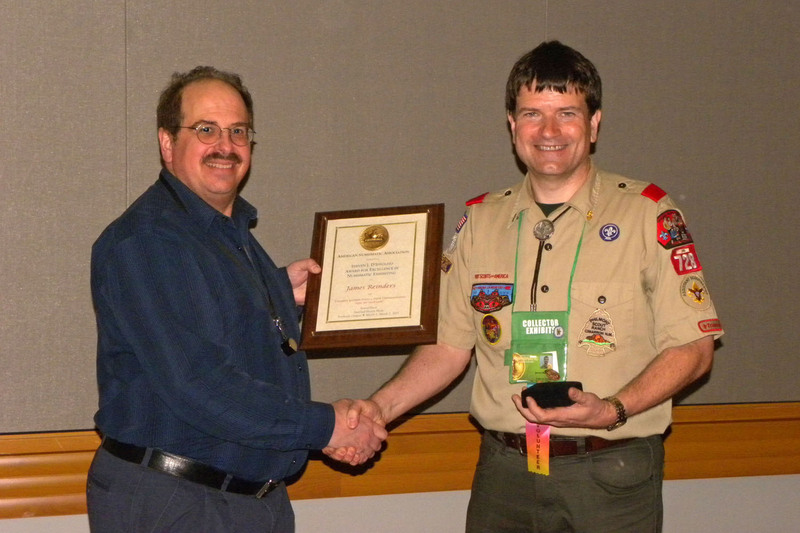 D'Ippolito (left) presents the Best-in-Show award to Reinders (right). The NMS exhibit award itself is named after D'Ippolito, a past Best-of-Show winner and donor to the ANA collector exhibit program. 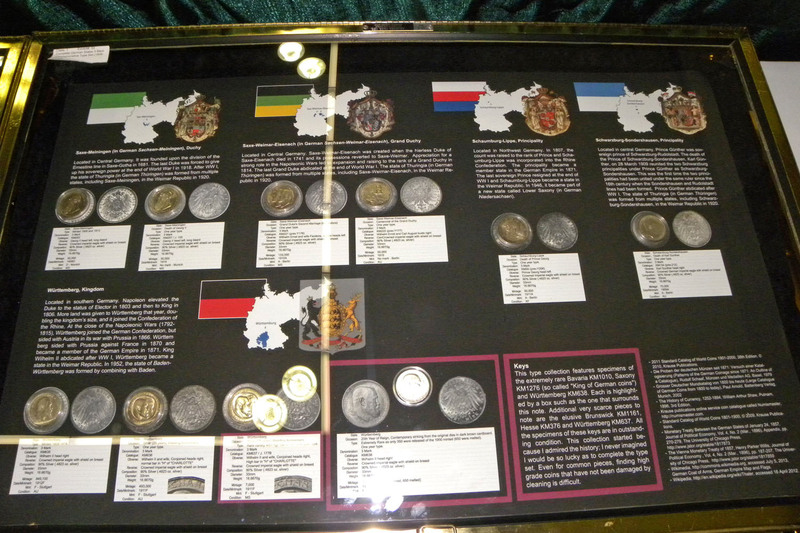 Photos (four cases): Reinder's winning exhibit, "Complete German States 3 Mark commemorative Type Set (1908-1918)." Excerpt from ANA press release: James Reinders, an ANA Life Member, received the Steven J. 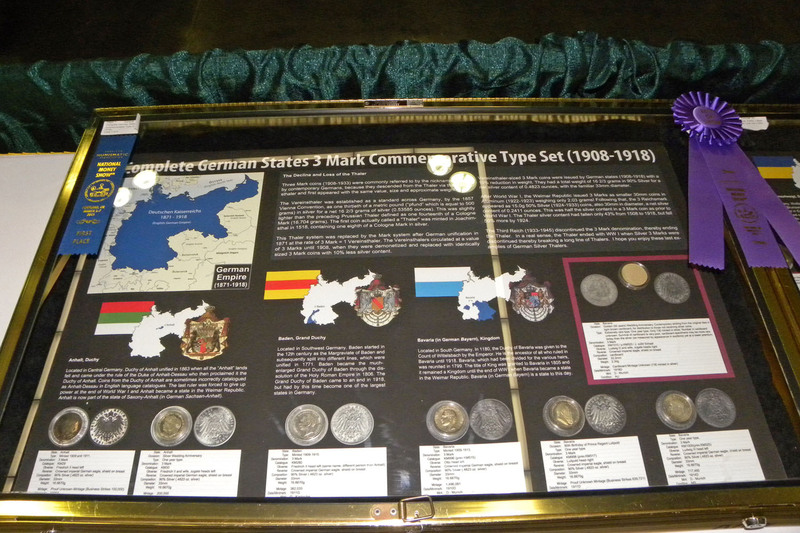 D'Ippolito Best-in-Show Exhibit award for "Complete German States 3 Mark Commemorative Type Set (1908-1918)" as well as second place Best-in-Show for "Encased 3¢ Postage Stamps of the Civil War" at the 2015 National Money Show. Third place was awarded to Simcha Laib Kuritzky for "Boy for Sale? Middle Eastern Ingots for the Redemption of the Firstborn Son." The Radford Stearns Memorial Award for People's Choice, determined by votes from convention attendees, was presented to Thomas J. Uram for "The U.S. Two Cent Piece 1864-1873 with Major Varieties." The National Coin Week Award was presented to Young Numismatist Alexander Mous for his exhibit "Alphabet Soup." 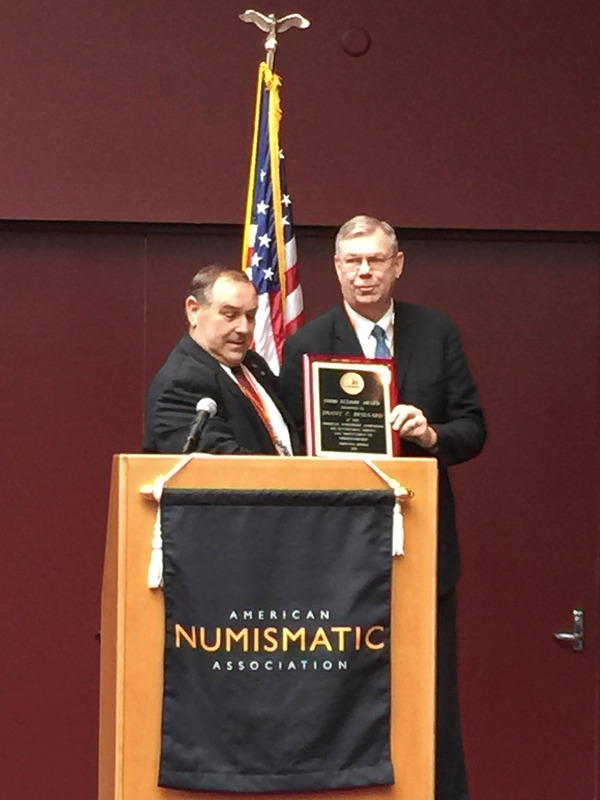 Mous will receive a full scholarship to a future ANA Summer Seminar, an award endowed by numismatist John Albanese. Mous also won third place for "Coins of Morocco: Reform Coinage 1960 to Date." Second place was awarded to Richard Jozefiak for "The Start of a New Collectable—The Innovation of the First Elongated Souvenir Coins at the 1893 Columbian Exposition in Chicago." National Coin Week exhibits are intended to be suitable for display in libraries and schools with a $250 limit on the value of the materials in this competition. Radford Stearns Memorial awards were also presented in six classes. This year, 35 competitive and two non-competitive exhibits were displayed in the Collector Exhibits area by 24 exhibitors. Auction - Stack's Bowers Galleries conducted the official auction of the Portland National Money ShowSM. See http://www.stacksbowers.com/. Raymond Kaskey "meet and greet" - See above. Scout (Boy and Girl Scout) Numismatic Workshops - Both the Boy Scout Merit Badge Clinic and the Girl Scout “Fun with Money” Patch Workshop were held 9:00 - 11:00 a.m. (session 1) and 1:00 - 3:00 p.m. (session 2) on Saturday, March 7, at the Oregon Convention Center. See the flyer and the YN scouting page. Report: The workshops were a success, with total attendance of 104 Boy Scouts, 12 Girl Scouts, and a number of others including parents, siblings, Cub Scouts, etc. Many of the workshop participants also attended the show. Special thanks to Boy Scout presenters James Reinders, Jeff Swindling and Andrew Reinders, and Girl Scout presenter Marilyn Reback. Also thanks to Sonja Bisgaard for managing the registration table. Lunch Event - On Friday, March 6, from 12:30 to 2:30 p.m., a Friendship Luncheon was held at the historic Huber's Café at 411 SW 3rd Ave in Portland. Cancelled due to insufficient sign-ups - Tour - There was a special bus or van tour scheduled on Sunday, March 8, 2015, to the site of the proposed U.S. Mint at The Dalles, Oregon. If you signed up and paid, your money was refunded. Museum Showcase features rarities worth $20 million - The ANA presented a stunning Museum Showcase of numismatic treasures and rare currency worth more than $20 million at the 2015 Portland National Money Show. The famed Brasher Doubloon, the famous Bebee collection of paper money and the American Firsts series, were featured in the Showcase. The American Firsts series includes the 1652 Pine Tree shilling, 1776 Continental dollar, 1787 Fugio cent and the 1792 half disme, all of which represent firsts in American numismatic history. Stay up to date on the 2015 National Money ShowSM - Whether you're at the show or wishing you could be there, NationalMoneyShow.com and Money.org are the places to be for photos, videos and news from the 2015 Portland National Money Show. Tune in at 3 p.m. Pacific on Friday, March 6, for a livestream of the 2015 ANA Board of Governors Candidate's Forum, moderated by Barbara Gregory, editor-in-chief of The Numismatist. At 8:30 a.m. Pacific on Saturday, March 7, tune in for the livestream of the Board of Governors meeting. Don't forget to follow the ANA on Twitter and check out the ANA Facebook page for pictures from the show. 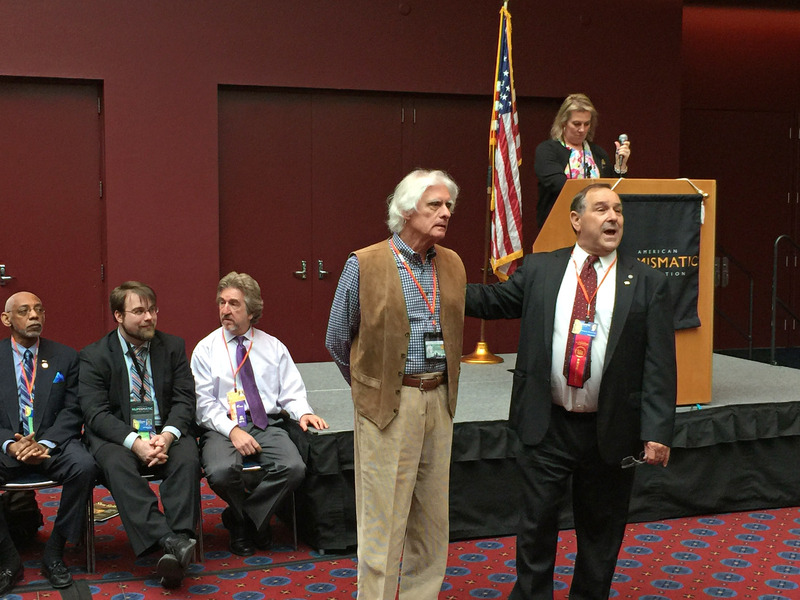 Free educational appraisals at the National Money ShowSM - During the final day of the National Money ShowSM in Portland, ANA members and the public could receive free, educational appraisals on up to three coins or other numismatic items at the Free Appraisals Area. Admission was free on March 7, the final day of the show. 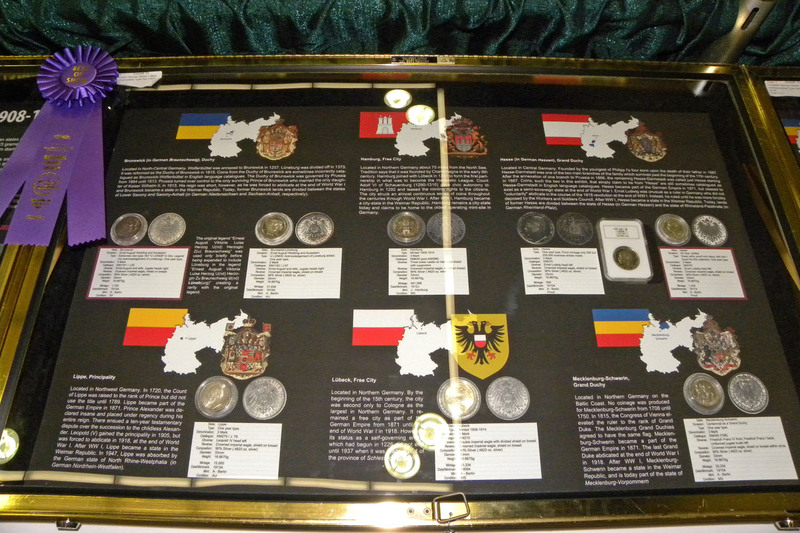 The Free Appraisals Area is designed to provide educational insight on the value of numismatic items. Coin appraisals are not binding and are for educational purposes only. Attendees having materials appraised were welcome to sell those items at the show for a price to be agreed upon by buyer and seller. Thomas Sparks, the founder of the Short Snorter Project, dropped eight vintage blue seal U.S. $1 silver certificate Short Snorters into circulation in Portland during the 2015 National Money Show. Sparks dropped four Short Snorter notes into circulation on Wednesday, March 4, the day before the show opened, and another four into circulation on Friday, March 6. Pages at the Portland National Money ShowSM - Young Numismatists who are ANA members had the opportunity to volunteer to be a page during the National Money ShowSM in Portland, March 5-7. Pages must be between the ages of 13 to 22. It's a great opportunity to experience a coin show first hand. The deadline was Feb. 6. ANA Young Numismatists are also eligible for YN Dollars, which can be used to bid in the YN Auctions held on Money.org. For all of the ways you can earn YN Dollars at ANA conventions visit www.money.org/young-numismatists/how-to-earn-yn-dollars. ANA clubs meeting space for Portland - Active ANA member clubs had the opportunity to receive free meeting space at the 2015 National Money ShowSM. Requests for space were due Jan. 17 in order to have your meeting listed in the Show Guide.